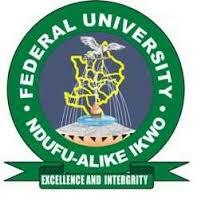 Alex Ekwueme Federal University, Ndufu-Alike, Ebonyi State (AE-FUNAI) Post-UTME Screening Results for 2018/2019 Academic Session Successfully Uploaded Online. This is to inform all candidates who applied for admission into the Alex Ekwueme Federal University, Ndufu-Alike, Ebonyi State (AE-FUNAI) for the 2018/2019 academic session that the results has been released. Finally, candidates should beware of fraudsters. The University has not authorized any person (s) to collect money from candidates for admission. Any money paid to individuals in that regard is at the giver’s risk. The University would not be held liable for it.